Saturday and Sunday social tennis changes to the winter timetable when the clocks change on 28th October, and will be at the earlier time of 1pm – 5pm. From the beginning of October, Tuesday and Thursday evening social tennis will be replaced by our internal winter league doubles competitions on Monday, Wednesday and Thursday nights. The first sessions will be held on Monday 8nd, Wednesday 10th and Thursday 11th November. Men up to and including 6th team standard and women up to and including 3rd team standard. Players must be of a standard that they can rally in a doubles environment. Time: 7pm – to 9pm (arrive at 6.45pm for a prompt start). Format: Doubles sets ‘Fast 4’ (set is to 4 games, no lets, sudden death at deuce). Points are accrued over the whole winter period for the ultimate prize ‘Champion of the Winter League’. Not necessary to play every week but a certain percentage is needed. Cost: £5 per session (this includes lights and balls) tobe paid in cash on court before playing. Please sign-up in the club house before the 4th of October. Once you sign-up, then you will be invited to a Whatsup chat group to organise each session on a weekly basis (number of players, pairs, etc…). Contact Sergio De Gaetano (0776 9188442 or sdegaetano@thorntontomasetti.com) in case of any questions. All playing levels welcome and you can turn up anytime between 7pm and 9pm. Sarah offers a warm up for both social tennis and those doing drills starting 6.50pm. Steve SR (when fit) will organise doubles for anybody playing between 7 and 9 pm; Richard C will organise otherwise. Numbers are limited on each night, so to book your place online or you will need to add your name to the relevant sign-up sheet on the club noticeboard that goes up one week in advance. If you sign up but then cannot play please inform the session organiser so that a player from the reserve list can be added in your place. 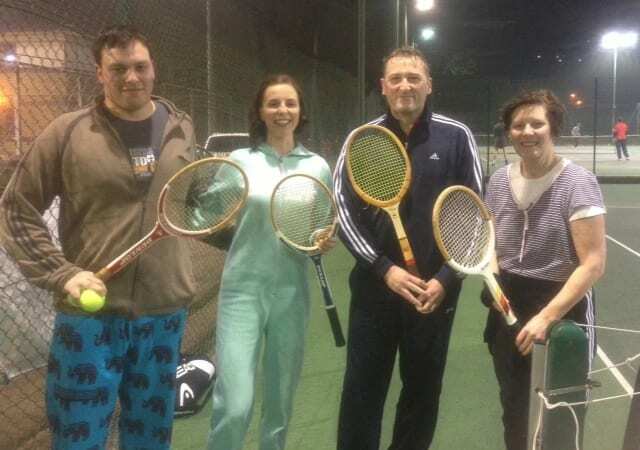 Whichever night you play on you should get a good evening’s tennis, as everyone is given a ranking and your evening’s playing partnerships are based on pairing couples so that you end up playing against a similarly skilled playing couple. Rankings are revised weekly and everyone moves up or down the ranks according to how well – or otherwise – they play. New members please note – in some games you will be paired with players stronger or weaker than yourself, and an important part of the winter league tournaments is about developing your skills at supporting partners with different abilities. Winter leagues cost £5 per person per night to cover lights and tennis ball costs.